Contemporary in design, some double bedrooms have a Juliette balcony overlooking the courtyard garden or their own private terrace. 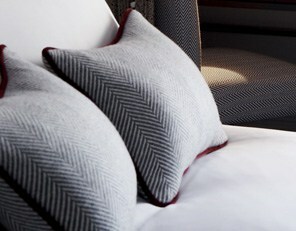 Each is individually furnished using all natural fabrics wool, linen & velvet in rich shades of deep red, purple & grey with a queen size Epoc bed & white Egyptian cotton bedding. Unique charcoal drawings of Oxford’s iconic buildings adorn the walls. Marble bathrooms with walk in showers & luxury amenities including steam demisting mirrors, underfloor heating, Noble Isle toiletries & linen bathrobes.